I am sure quite a huge number of Facebook users have been unhappy with Facebook trying to force its Facebook Messenger app down our lifestyle. Why can’t we simply be done with a single app taking care of everything? If you too are annoyed of having to use Facebook Messenger app for chatting with your friends and family, here is how you can continue chatting on Facebook without the need of messenger and have something stop this auto-redirection! If you have a jailbroken iOS device, you can keep on chatting on your smartphone and tablet without the need of having to install the FB Messenger app. This nice little tweak called FBNONeedMessenger lets you chat on your iPhone or iPad right on the Facebook iOS app. It actually prevents the app from redirecting you automatically to the Messenger app whenever you tap on the Messages tab. Since Facebook has not yet removed the chat functionality from the Facebook app, this little forceful prevention helps you seamlessly chat on the Facebook iOS app as ever! 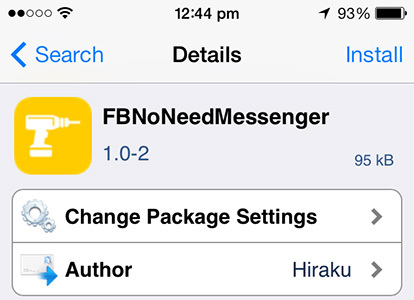 FBNoNeedMessenger is a no fuss sort of tweak as it comes for free and with no settings whatsoever. Simply go to Cydia > BigBoss repo and install this tweak from this link and ta da! Once installed, it will start preventing Facebook app from the redirecting action. Updated iOS 7 Jailbreak Tweaks – 3D Animation, Hidden iOS 7 Menus, App Switcher, and More!